Chris Case predicted this swell. On October 1, the wizard looked, and picked out this November swell from the swirling clouds that billowed and swept round in that crystal ball he has behind the wall of magic in the cottage by the lake. He told me about this swell. Chris’s thirty-five day forecasts are spot on. He told Will Skudin too, told him, ‘I’ll see ya then’. I don’t know how seriously Will took this prediction. 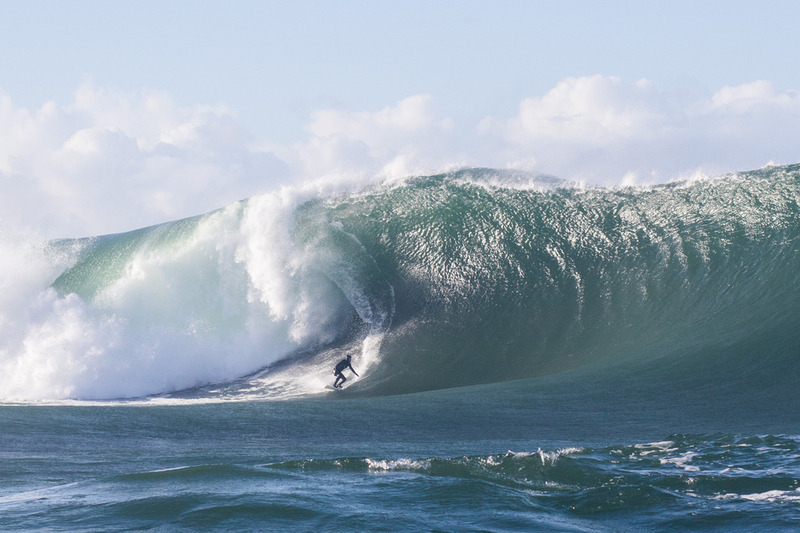 But a month later, Will saw this on the charts and took a double red-eye away from a warm, idyllic, palm-frond wavering island of Maui, all the way to cold and windy Bundoran, where he caught a little cat nap, a quick safety meeting, and paddled out to the lineup at Mullaghmore, and waited. This swell peaked at the 14.5ft @ 17 seconds mark, accompanied with a fresh westerly wind. Enough to make Mully grunt. 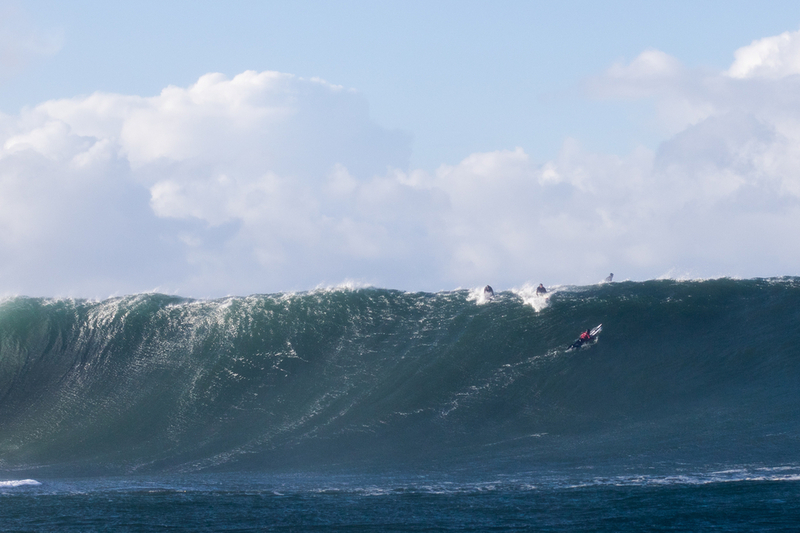 What ensues is a day of incredible waves, some celebratory, others are brutal wipeouts – it is the price of admission. And you’re in safe hands with the Irish Tow Surf Rescue Club. When Will finally saw the wave he wanted and went for it, he just got a little too much air under his fins. 42-minutes later, Will was waiting outside triage at Sligo General Hospital, and scrolling through his phone and saw an old text. …And the goosebump thrill of sudden realization made him smile over the pain. Chris Case, the wizard, of they call, Fish Farm was dead-on-balls accurate. Will’s smile would be short lived. He was about to go into triage, where somebody made a very good decision to x-ray the wound. And Will was about to meet a woman from South Africa who got a sudden giddy thrill that she would have to dig around in Will’s leg muscle, looking for tiny shards of fiberglass that shattered when it hit his bone. 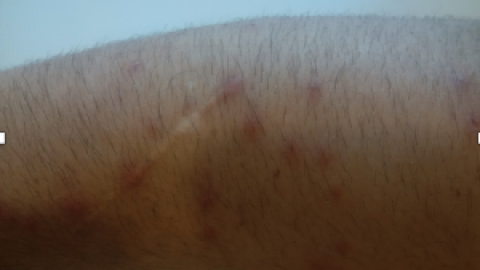 The damage and foreign objects extracted from Will’s leg. © 2017 – Will Skudin. Peter was right. Peter is always right when it comes to water safety. As a fireman and paramedic in the wild city of Dublin, Peter is no stranger to injury and gore. He deals with human death up close and regularly at work, and has no desire to see it at his beloved slabs. 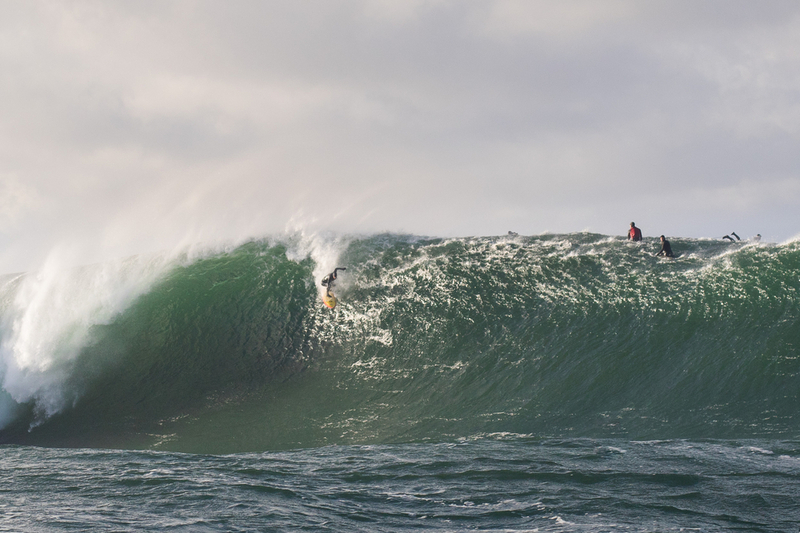 Peter, along with the members of the Irish Tow Surf Rescue Club, are the official lifeguard body of the Irish big wave slabs. 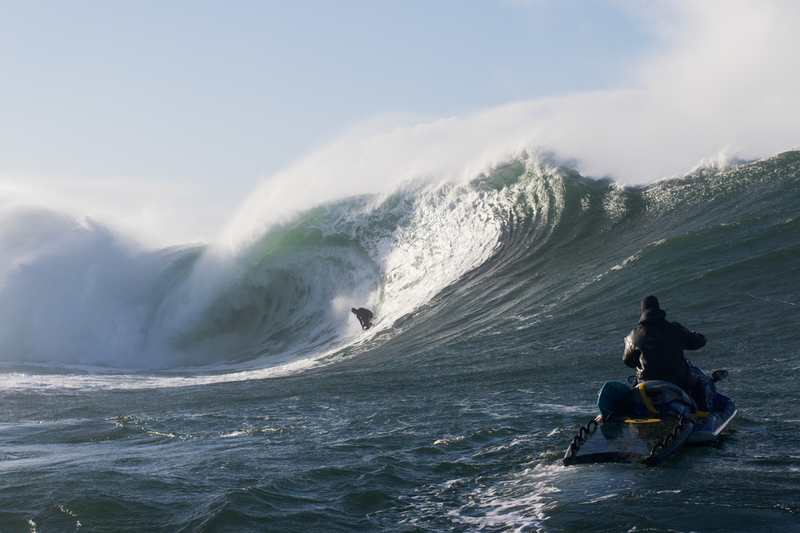 If you’ve been to Ireland to surf heavy waves, you have met Peter Conroy. 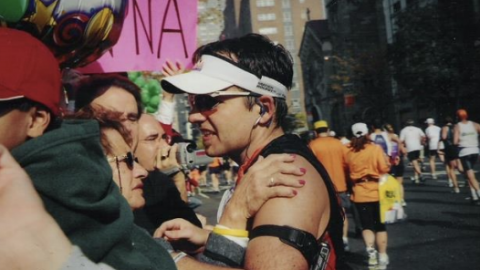 If you’ve been in a tough spot, Peter has probably saved your life, or at least your limbs. 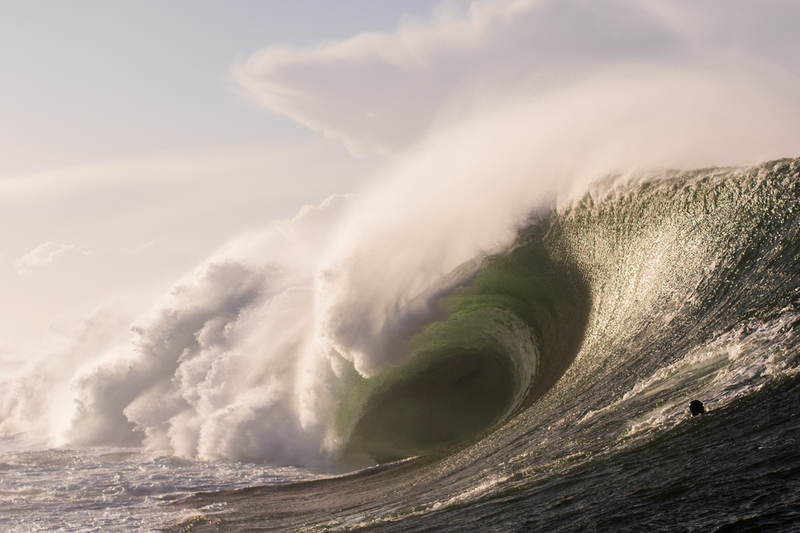 If you are planning a heavy, death-defying trip to Ireland’s heaviest waves , you will meet him. Or me. Or one of the several other rescue operators trained and experienced to save. We do this because we love you. He is the beacon of politeness. He is trained and experienced and spends his time on rescue. He is generous and kind. He appreciates a line-up where everybody says hello, where everybody takes turns, is patient, respectful, and comes full of love for as much as knowledge of the reef he’s had his teeth sunk into. 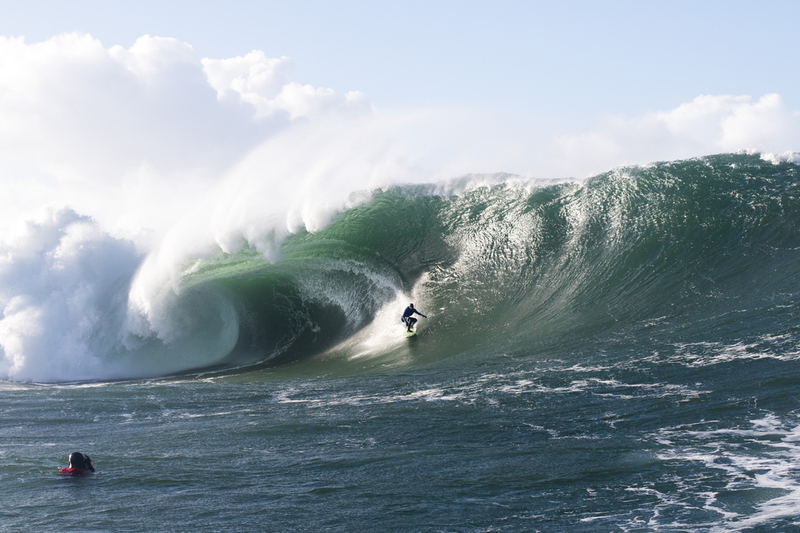 Connor’s character and reputation is massive, and compounding that, a determination that comes from being born and raised a Mullaghmore waterman. 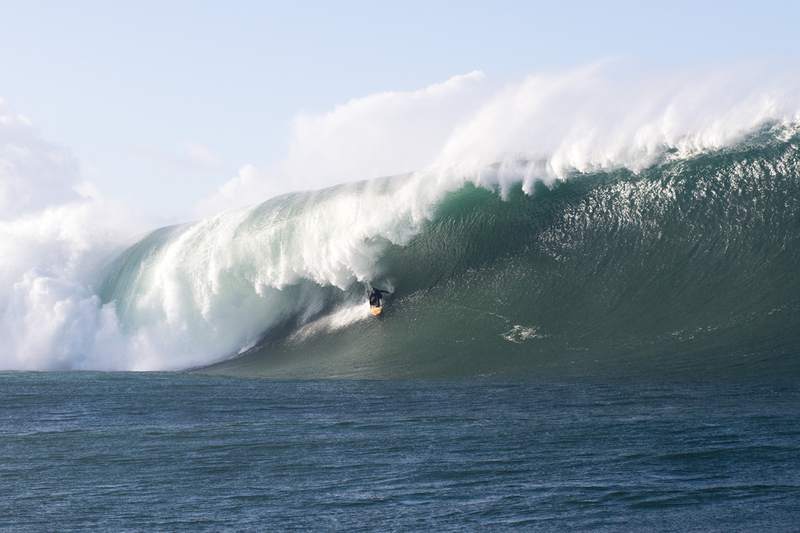 Conor Maguire on a Mully bomb. 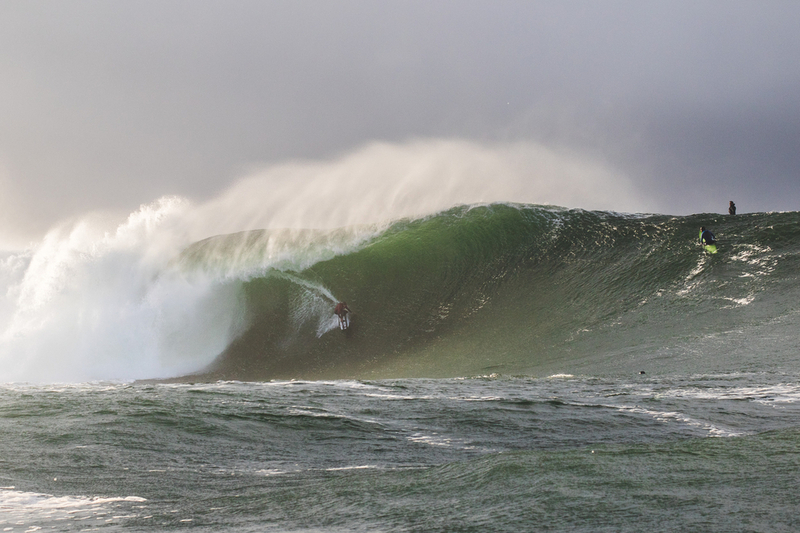 At the start of the Flurry, Conor Maguire flung his special blunt fronted board down a heaving face riddled with steps, but he had a nice entry, and Mullaghmore is a place where if you have a nice entry on a big one, you chance what’s coming. A beautiful drop, but then, as he looked up, a converging, collapsing section was coming down, not open enough to get into it safely. He did the only thing he could do and jumped, which prevented a direct hit by a lip the size of small apartment. Because both Peter and I were doing rescue, and because all the photographers were so understanding, it was easy to ensure a designated rescue ski. At this point, what I saw Conor do was the scariest looking of many wipe-outs I had seen that morning. After he jumped he was sucked over on a wave even the most stalwart big wave under-estimator could not call less than 20-foot. When I went in to get him from behind the wave, it looked like someone just dynamited the entire underwater reef, plumes of white rose up in a hill in front of me, and I had to turn around, away from Conor’s bobbing, tomb-stoning board. I have seen Conor put himself in ridiculous places before in the quest for the best waves at Mullaghmore, but that was out of hand. Conor maintained his composure The nose of the board was still up in the air, with Conor way down under, when the second wave went over him, both me and Peter drove after where his board last was, our skis stuck in the turbulence like a sedan on a soft sandy beach. Finally, I saw Conor and his board pop up in front of me, Conor breathed out slowly, battered, but fully aware. “Oh my god.” He said. I’m not sure if he meant god with a capital G. But I was glad to see him on the surface. I have seen Conor put himself in ridiculous places before in the quest for the best waves at Mullaghmore, but that was out of hand. Conor maintained his composure. 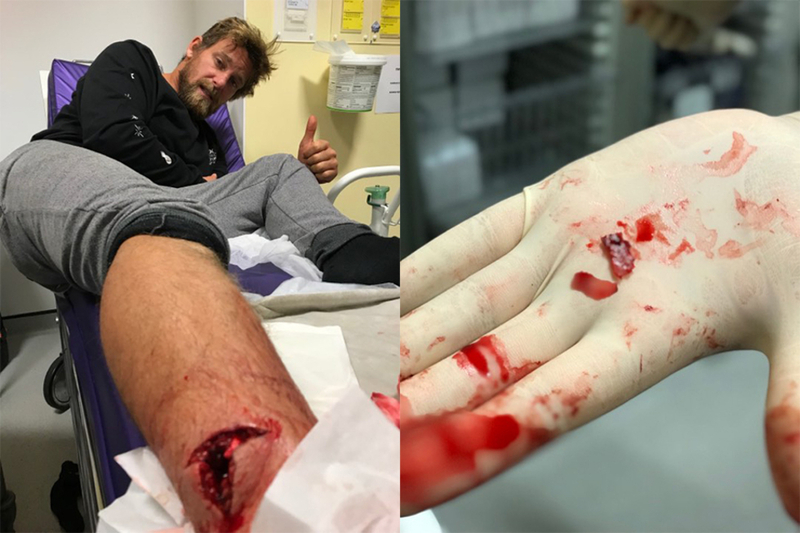 The only other surfers on their backhand were Barry Mottershead, Russell Bierke, Matt Bromley and Sancho, a Billabong pro who charged hard, making an amazing floating, free fall drop and an impressive double pump cannonball claim into a 20” closeout. 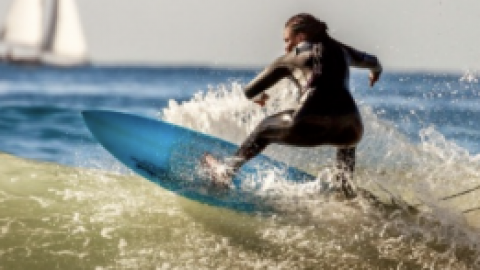 Aggressive and brave surfing. Barry Mottershead, in contrast, has a nicely quiet presence in the line-up. Barry started out the day, sitting in the line-up alone for an hour, having close looks, dodging 30” sets while the channel filled up with pro surfers and the tough, grizzled watermen photographers that follow them. Barry Mottershead knows Mully’s no joke, and stroked into this gem. After an hour or so sussing out the line-up, Barry gets a lovely first wave that he makes, one of the very few set waves ridden successfully. A confidence builder not only for him, but all the steel-eyed young pros still sizing up the challenge from the channel, as well as young Conor, who had just jumped off the rocks after seeing Barry’s wave. 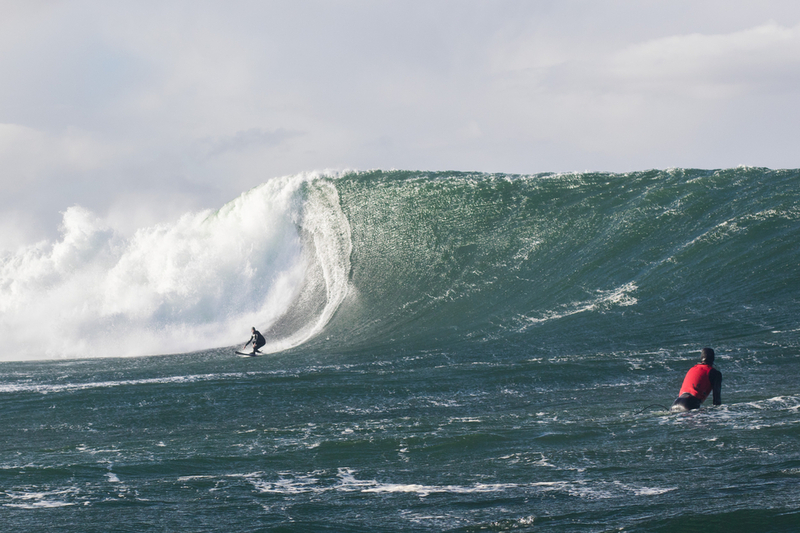 Barry, a very all round capable and resourceful South African ex-pat, has been living in the Mullaghmore area for more than a decade and is one of the experts likely to be looking after you when you come on your crazy, big wave mission to Ireland. This session was a high note of action of big wave surfing. The peak of a swell finally hitting a big low tide on a golden sunshine, early winter day. The onshore wind stayed light enough to keep the faces clean, but mashed down big barrel sections of the wave. Some held, some didn’t, and there is no way to tell on the take-off. SA charger Matt Bromley is used to heavier waters. Matt Bromley chose some beautiful waves and rode them well. 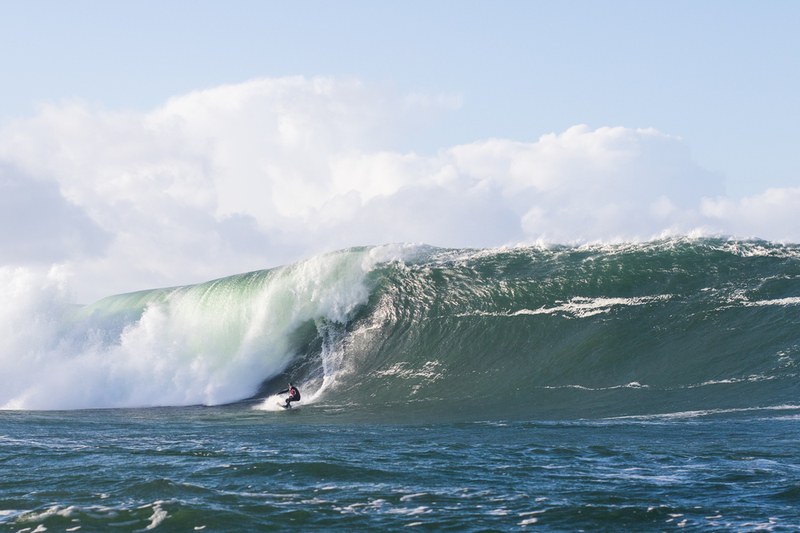 If anybody is built for big wave surfing, it is Matt, a positive, and long-armed eager young man who is a standout from Jaws to Dungeons, and loves the slabs here in Ireland. Matt is one of the world-class surfers who understands how important the Irish Tow-Surf Rescue Club is to, not only their safety but their goals as well. Nic Von Rupp rode several huge and beautiful waves from the outside, got one completely outstanding, tall tube, and like everybody else, got smoked by the heaviest waves this season. Nic is a big fan of our rescue club, coming on strike missions with pro filmers like Guy Mac, he puts himself under tremendous pressure to perform, and has donated 500 euros recently, on top of the membership fee, and still offers to use his skills and experience to sit safety every session he is out there. Thanks Nic. Natxo Gonzalez was typically on fire, but even his ratio was half make and half dangerous wipeouts. Russell Bierke, spending a good amount of time this year getting to know the reef hellbound for a 20-foot tube, and, having getting snuffed again by a collapsing mega-section, came up having hitting and getting dragged along the reef. Barry went down hard and got a beating. The Flurry was well under way. Two hours of the most captivating attempts at huge giant slabs by the world most dynamic and brave young surfers. It was fireworks of light and huge barrels. More giant sets attempted in a session than I’d seen in a year, but scary because of the success rate. Then, Will Skudin freefalls into that one no one else, not even that crew on that day, wanted. I expected gore, and I think so did he, a leg at an odd angle, and so was relieved to see a very painful looking gash. Stitches and the end of the session for sure, but nothing more. Little did I know what Will was in for, after they got his first x-ray back down at the hospital. Empty and heavy, emerald hues. Will is here regularly. Will has the classic lifeguard mind. Raised in a family of swimmers, he is a trained and experienced rescue man at Mullaghmore, he had donated his time, essential and difficult to obtain equipment like rescue sleds and key components. Will is an avid supporter of the community and the professionalism of our rescue team, and he was transferred to our guardian angel, the paramedic on the ski, Peter Conroy, who was on the radio to the wise old captain Paul O’Kane who was our man on the bluff for this crazy day. When you come to Mullaghmore we will look after you, too. 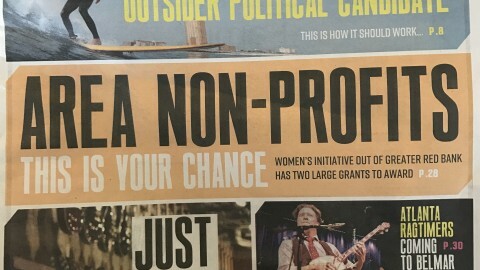 One of us will be there, no matter who has to work and who has to look after the kids. One of us will be out there, looking after you, keeping you safe. It’ll be me or Peter, Barry or Conor, Will or Paul, Nic or Eryc, the Irish Tow Surf Rescue Club makes sure you have one of the most capable designated safety guys out there for the session. What we ask in return, is 30 euros when you get here or before you leave to become a member of the club for the year, as well as coming here with the basics of CPR and lifeguard training and your willingness to participate in this community of safety that encourages those who know their abilities in big waves as top notch to charge one of the world’s most dangerous big waves in the safest possible way. 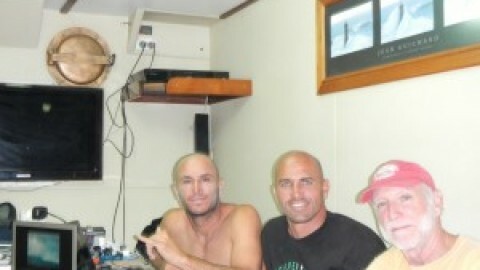 If you want to help the Irish Tow Surf Rescue Club, get in touch with the boys HERE. Russell Bierke’s putting in the hours at Mully, becoming a regular face.